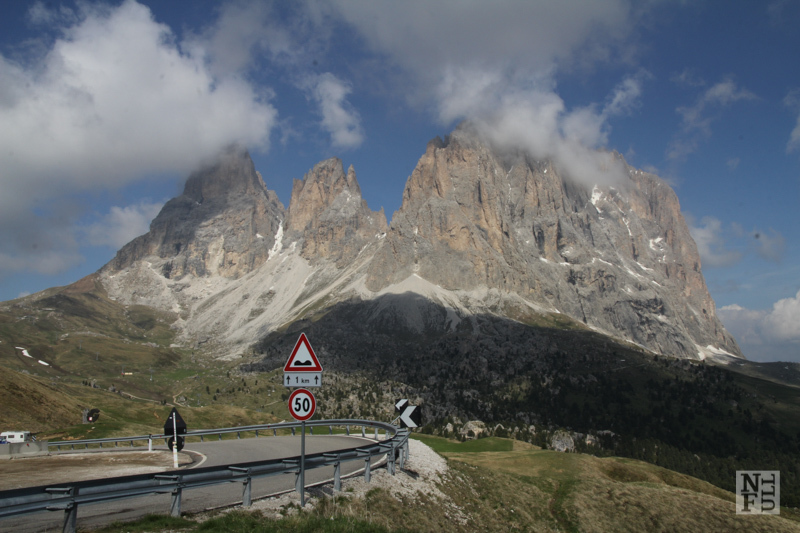 If you ever come to the Dolomites you must drive this road! Route 242 (SS 242, Strada Statale) is one of the most beautiful roads I have ever seen. Moreover, you can enjoy amazing views both on foot and through the window of your car. 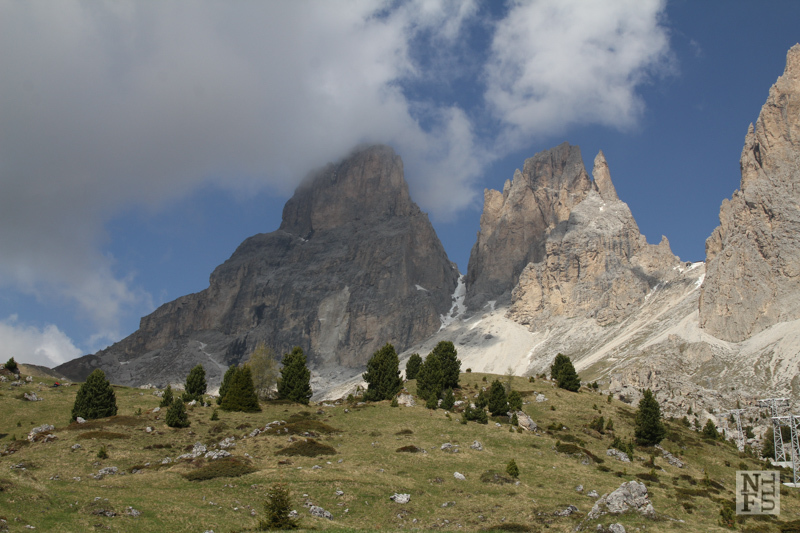 The Italian Dolomites are well organized, the infrastructure is impressive and you will find visiting them delightful! And SO easy! 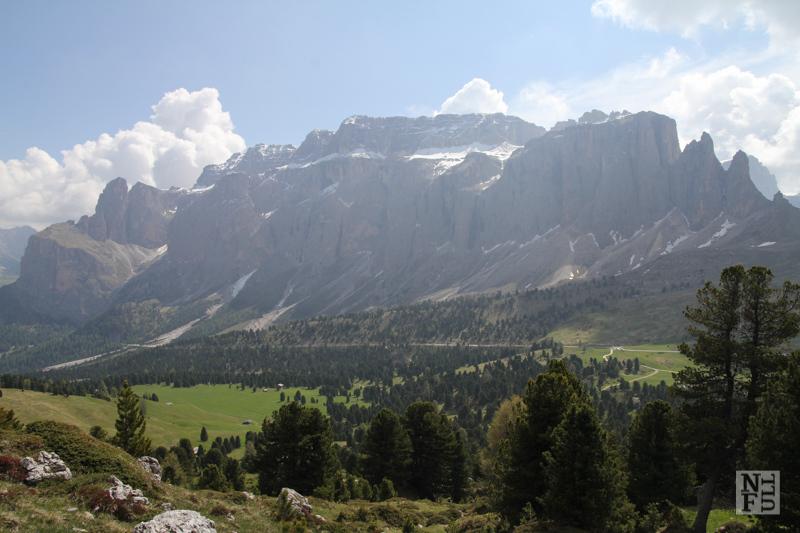 If you are a skier you should know so called Sellaronda – a very long ski circuit, literally around Gruppo Sella. One of our daily trips started in Passo Sella. This is a marvelous place with breathtaking views. 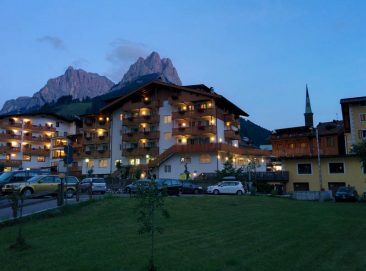 We drove from Canazei, where we stayed at AirBnB, and drove up to Passo Sella located at 2180 masl. 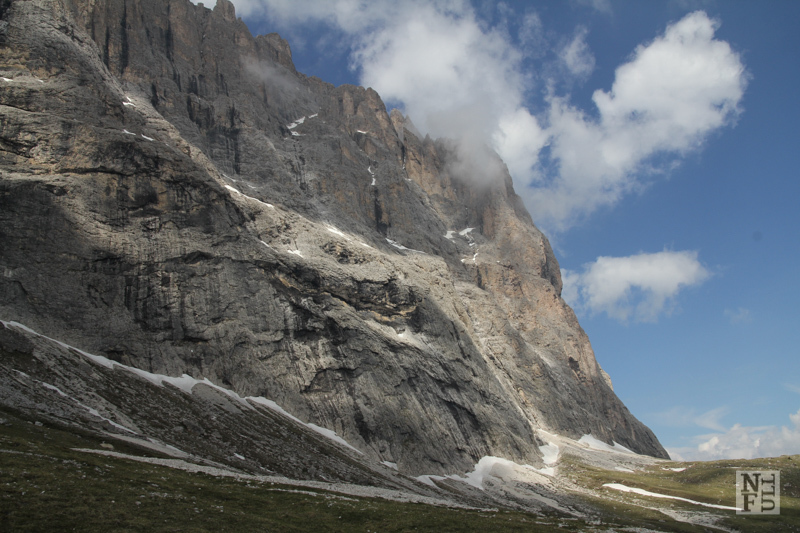 The pass (or saddle, if you like) crosses two large massifs: the first is Gruppo Sella and the second is Sasso Piatto. There are summits that rise above 3000 meters above sea level in both massifs. Thus, the pass is really beautiful because you see two large valleys below and rocky peaks above. 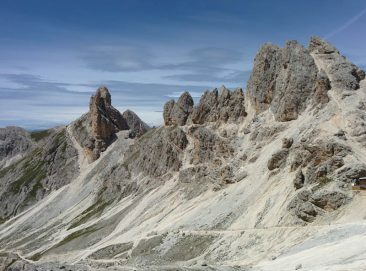 Sasso Piatto seen from Passo Sella, the Dolomites, Italy. Either driving through the pass or walking the trails from the pass up to the mountains is a pleasure. The driving in this part of Italy is a bit demanding. You need to be focused on the road and be skillful enough to drive through numerous 180-degree turns. There are many motorcycles driving these roads so you need to be extra careful. 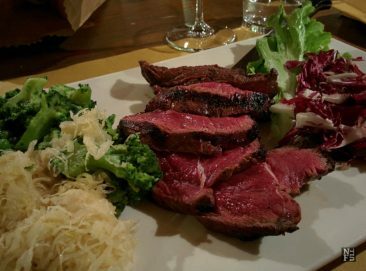 We picked up a trail number 526 with the intention of arriving at refuge called Vicenza, at the other side of the massif. It all started nicely, from an interesting rock formation called Rocky City (Citta dei Sassi). The path was very comfortable there, and some parts are even suitable to walk it with a stroller. 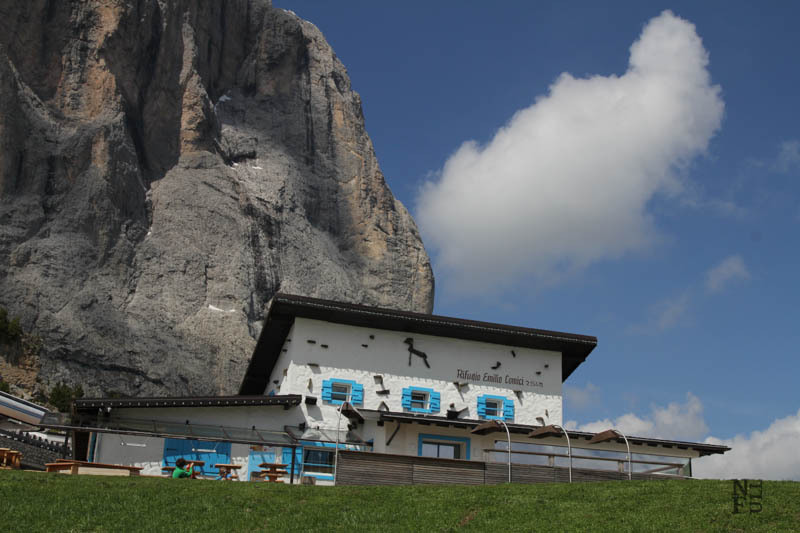 Further up, there is a nice refuge called Emilio Comici, situated in a marvelous spot, looking at the Gruppo Sella. You can see the whole massif from there, in its majesty and beauty. As this was out of the season, the refuge was closed. There were some people doing spring cleaning, but we could not enter, nor eat anything. 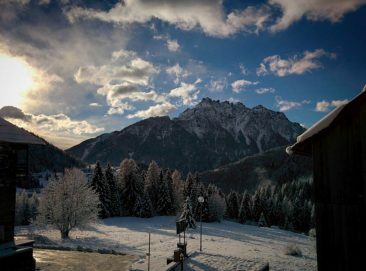 This is the downside of visiting the Dolomites out of season. Sassolungo. Scree along the way. Dolomites, Italy. Therefore, we continued our walk towards the next refuge. As we picked up a path close to the slope we had a long and bumping way to go. Apart of the distance, the difficulty was to cross every couple of hundred meters a sort of little hills created by the numerous scree. As a result, we got tired quickly, there was no sign of the refuge in our sight and when we came to a crossroads we saw a storm coming from the other side of the valley. 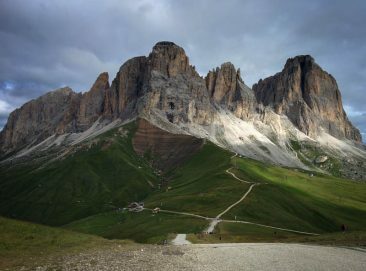 Refuge Comici, the Dolomites, Italy. In this circumstances, we decided to go back rather than continue to the shelter. On our way back we picked an alternative path so we could meditate the beauty of these peaks of Sasso Piatto from a distance. All in all, this was a fabulous day, with nice sunny weather and fantastic views. Highly recommended, especially to the fans of epic views of rocky summits. On my recent trip to Bolzano, my boyfriend and I made a day trip to visit the lower Dolomites. Because we had gone early May, many of the lifts were closed and many trails were inaccessible to average hikers. Your photos definitely make me miss the beauty and grandeur of the place, but I’m glad to hear you got the chance to experience it!